How do you charge for your services? A question THE JUNK DR gets quite frequently. Well it has a lot to do with the Earth’s gravitational pull on the moon and whether Mercury is in retrograde……j/k 😎 . Seriously though, being a locally owned and operated company, not a franchise, gives THE JUNK DR some flexibility in his pricing. The majority of junk removal companies base their pricing on volume. While this is a nice upfront way of knowing how much it’s going to cost, THE DR doesn’t necessarily agree that it is the fairest way to price. For example: should a trailer load of cardboard cost the same as a load of construction material? We always take into consideration what we are hauling, the weight of the items, where we are taking the items for disposal, and the time and fuel it takes us to do the job. However, we do have a $50 minimum service charge. Every county and landfill charges different for disposal. Businesses do pay additional fees for some items, such as; TV’s ($25/per), computer monitors ($25/per) and tires ($2.50/per, on a rim add $2.00). These, of course, would be additional fees on top of any quoted price. 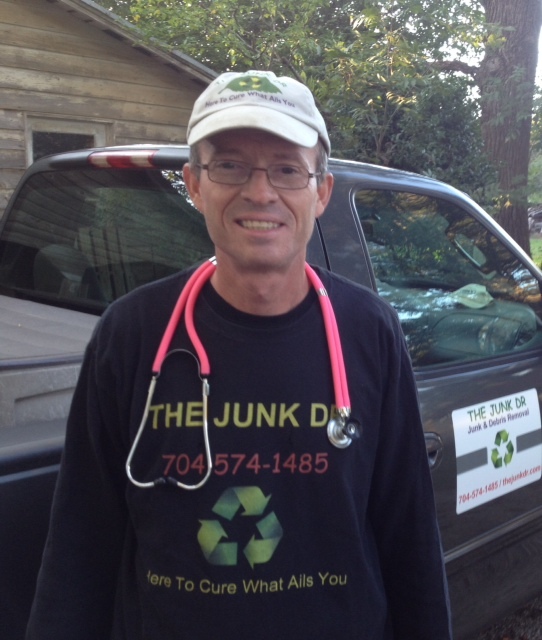 Feel free to reach out to THE JUNK DR directly @ 704-574-1485 or through our contact page for more information. We look forward to hearing from you soon. Thanks! !